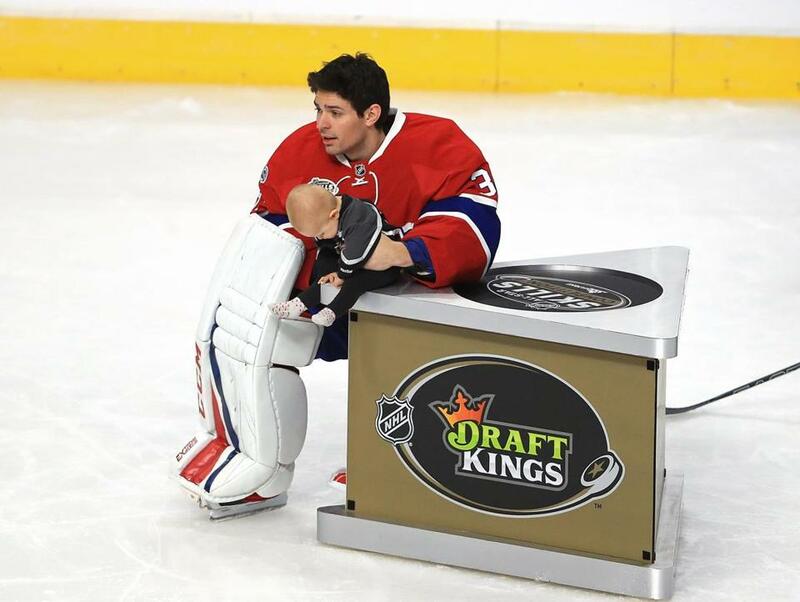 Carey Price of the Montreal Canadiens held his daughter in the DraftKings NHL Accuracy Shooting event in January. DraftKings Inc. has raised more than $100 million in a private investment round led by one of the owners of the Los Angeles Dodgers, an infusion of cash that bolsters the company’s finances as it awaits federal review of its proposed merger with rival FanDuel Inc. The round was led by Eldridge Industries, a media holding company whose properties include entertainment publications Billboard and The Hollywood Reporter. Eldridge is headed by Todd Boehly, one of the Dodgers’ principal owners. DraftKings did not disclose the amount of the fund-raising, but a person with knowledge of the deal, speaking anonymously to discuss confidential financial terms, confirmed it was worth more than $100 million. The investment was first reported Thursday by Bloomberg. In a statement, DraftKings chief executive Jason Robins praised his new investor’s entertainment-industry credentials. “We were looking for a funding partner who could bring additional depth to the table. The exceptional team at Eldridge does that through their incredible knowledge and success with media properties,” Robins said. It’s unclear what DraftKings’ valuation is after the new investment. Just six months ago the company raised $150 million from private investors, a deal that put the value of the company at around $1 billion. Boston’s DraftKings and New York-based FanDuel announced in November that they planned to merge in a bid to consolidate marketing, legal, and other costs in an industry facing new levels of regulation. In daily fantasy sports, contestants construct hypothetical rosters of real-life athletes and compete for cash prizes based on those players’ in-game statistics. The industry expanded rapidly in recent years but faced serious questions about its survival after several key states began asking if the companies violated gambling and consumer protection laws. Still, daily fantasy sports is a big business: Research firm Eilers & Krejcik Gaming estimates that players spent $3.26 billion on the contests in 2016, up about 4 percent from a year earlier. The companies typically keep about 10 percent of those player entry fees as revenue, with most of the rest going toward prizes. DraftKings and FanDuel had been fierce rivals, but the legal controversies that began in late 2015 prompted the two companies to cooperate on courtroom and lobbying strategies. Their most consequential regulatory victory was in New York, which passed a state law in 2016 allowing cash-prize daily fantasy sports. That ended a legal challenge from state Attorney General Eric Schneiderman, who asked a judge to ban DraftKings and FanDuel for violating state gambling law. The DraftKings-FanDuel merger, expected to close this year, would result in one company controlling more than 90 percent of the market for daily fantasy sports. The Federal Trade Commission will review the merger, which could also face scrutiny under state antitrust laws. DraftKings has now raised more than $830 million since its founding in 2011, according to a Globe tally of securities filings and media reports. Before the legal controversies erupted, DraftKings commanded a valuation of about $2 billion.